↑ Roberts, Michael (2003). The Age of Liberty: Sweden 1719-1772. Cambridge University Press. ISBN 978-0-521-52707-1. ↑ 4.0 4.1 4.2 Lindqvist, Herman (2009-11-29). 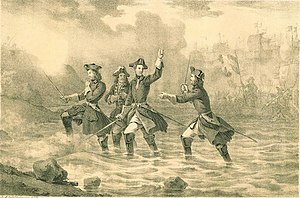 "Karl XII:s död ger inte forskarna någon ro". Aftonbladet. ↑ Anisimov, Evgeniĭ Viktorovich (1993). 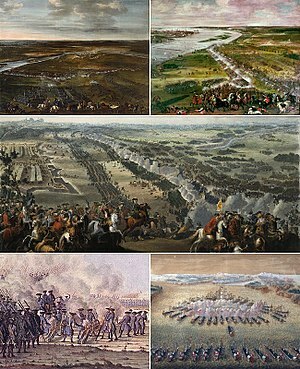 The reforms of Peter the Great. Progress through coercion in Russia. The New Russian history. M.E. Sharpe. p. 53. ISBN 1-56324-047-5. ↑ Groß, Reiner (2007) (in German). Die Wettiner. Kohlhammer Urban Taschenbücher. 621. Kohlhammer. pp. 181–182. ISBN 3-17-018946-8. ↑ Frost, Robert I (2000). The Northern Wars. War, State and Society in Northeastern Europe 1558-1721. Longman. pp. 230. ISBN 978-0-582-06429-4. ↑ Frost, Robert I (2000). The Northern Wars. War, State and Society in Northeastern Europe 1558-1721. Longman. pp. 230, 232. ISBN 978-0-582-06429-4. ↑ 22.0 22.1 The Century. 21. The Century Co.. 1881. ↑ 23.0 23.1 Alexandr Konstantinovich Chicherin (Александр Константинович Чичерин) (1883). Исторія Леиб-Гвардіи Преображенскаго полка: 1683-1883 г..
↑ Исторія Петра Великаго. В Тип. К. Жернакова. 1843. หน้านี้แก้ไขล่าสุดเมื่อวันที่ 25 กุมภาพันธ์ 2562 เวลา 12:45 น.